1 Mix the yeast with 175 ml lukewarm water and a pinch of sugar. Add the flour, olive oil and salt and knead into a smooth dough. Cover and leave to rise in a warm place for around 1 hour. 2 Heat the oven to 240°C (220°C in a fan oven), 475°F, gas 9. 3 Shape the dough into 4 balls and roll out on a floured work surface into round pizzas and place on 4 greased baking trays. 4 Spread the tinned tomatoes on top leaving 1 cm of the edge free. Season with salt and ground black pepper. 5 Place the ham on top, then add the cheese. 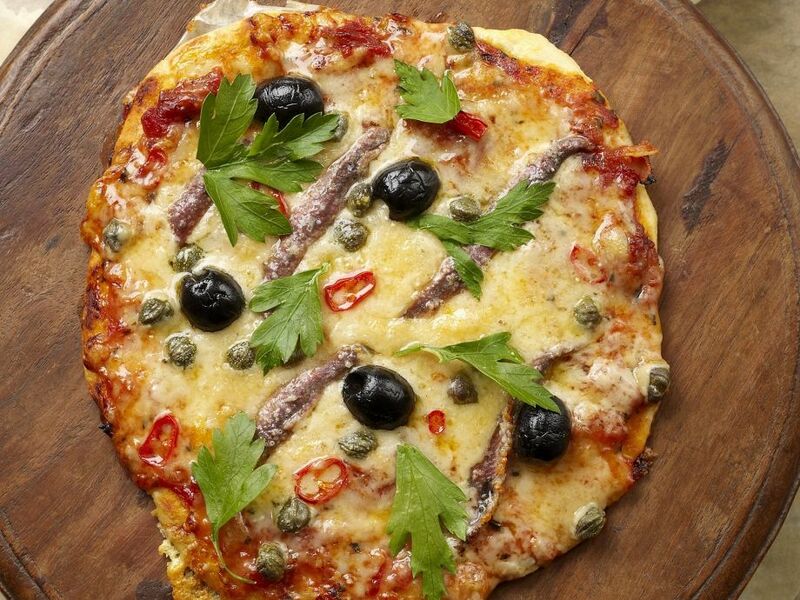 Sprinkle the pizzas with the chilli and top with the capers, sardines and olives. Drizzle with a little oil and bake for 25 minutes until golden brown. Serve garnished with parsley.